Notes of tiny sweet wild huckleberries. Then flavors reminiscent of a light mocha with cream emerge. The finish is as if you are tasting a whole bowl of the tiny sweet wild huckleberries. In a class today I heard someone say "I know that the chocolate from different origins tastes different but I don't know how to explain it". Sometimes it is difficult to find the right word to express what you are tasting. That is perfectly alright. Palate training is developing your sense of taste as well as your memory. If you can remember what the flavor notes remind you of, it will be easier to find the right words. Dan and Jael of French Broad Chocolates are one of the nicest and most genuine couples you will ever meet. 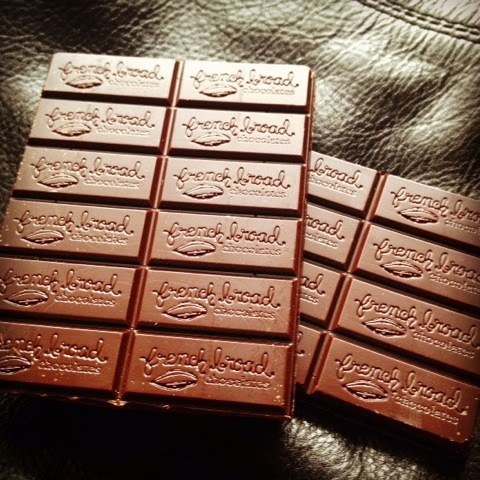 They have a factory and the French Broad Chocolate Lounge in Asheville North Carolina where make both bean to bar chocolate as well as beautiful chocolates (confections) with intense flavors. Someday I'm going to visit that chocolate lounge and have my fill of their chocolate, cakes, truffles, and chocolate beverages. I'm not leaving until I'm completely stuffed!